QUESTION: Mr. Armstrong, at the conference you said the US share market would continue to move sideways and there will be no breakout to the upside until 2016. After Fridays action I assume this is still on target. Where is support this time? ANSWER: The key support lies down at 16887. 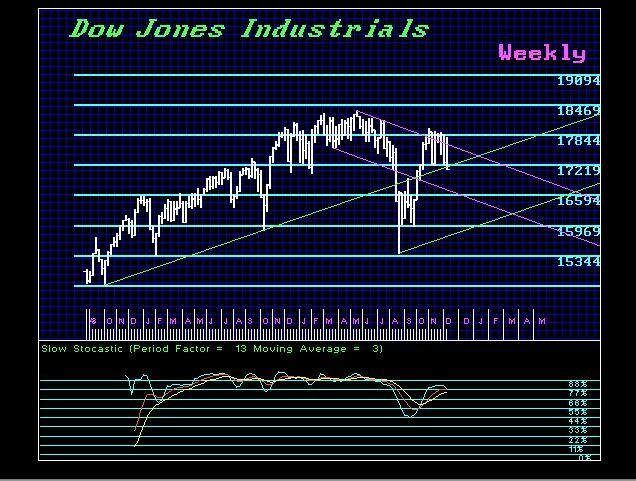 We need a weekly closing below that to retest the last major low. I will be doing a short video on each main market for year-end for the attendees starting next week which will be part of the Year-End Report we provided. We have generated two minor Weekly Bearish from the high on this rally which took place intraday the week of November 2nd. 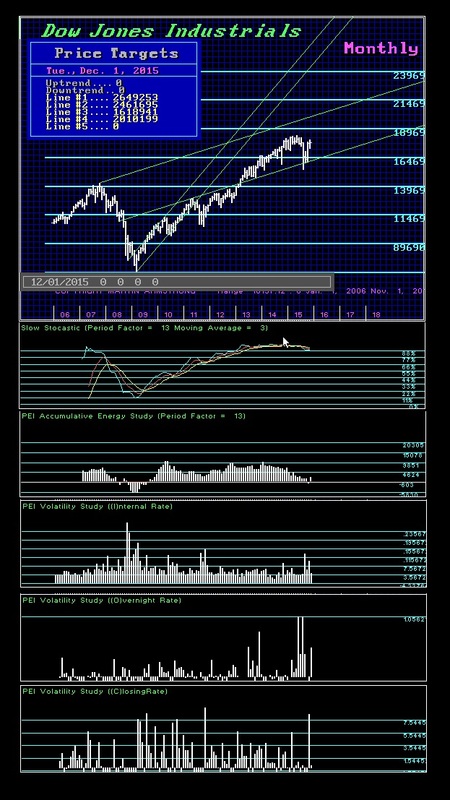 Looking at the yearly level, right now our closing support for the U.S. share market based on the Dow Jones Industrials lies at 17608 and 16590 for the 2015 close. A year-end closing above both will keep the market in a bullish posture. Target resistance for 2016 stands at 19922, 23378, and 26292. If we look ahead into 2017, these levels will rise to 20830, 23287, and 27200. There are only TWO possibilities which will be determined from the closings. Either we see a 2017 high in a Phase Transition now, which typically will not last beyond 13 months, or we continue to base into 2017 and then we completely invert meaning the high is pushed off into 2019/2020 with the bottom of the ECM. 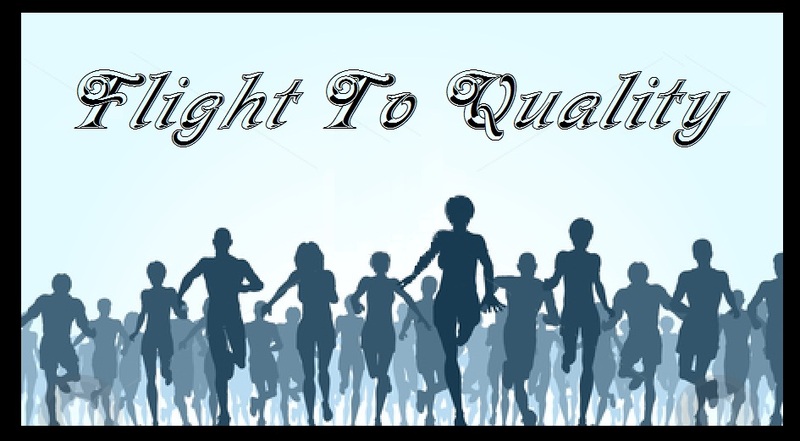 Eventually, what has to happen is this shift from PUBLIC to PRIVATE whereby the flight to quality is to private assets and not government bonds. Those who keep arguing for hyperinflation do not understand how the economy functions. I have stated that such events take place only in the peripheral economies like Germany following the 1918 Communist Revolution where they invited Russia to take Germany after World War I. The confidence in the government completely collapsed and the currency became worthless. Of course the goldbugs twist this story into the mere fact that paper money existed and the quantity increased and that was the cause of the event. They ignore the fact that this was a communist revolution and people hoarded their money and used the money of neighboring states. They also ignore the fact that the new Revolutionary Government DEFAULTED on all government debt. These are fact they omit. 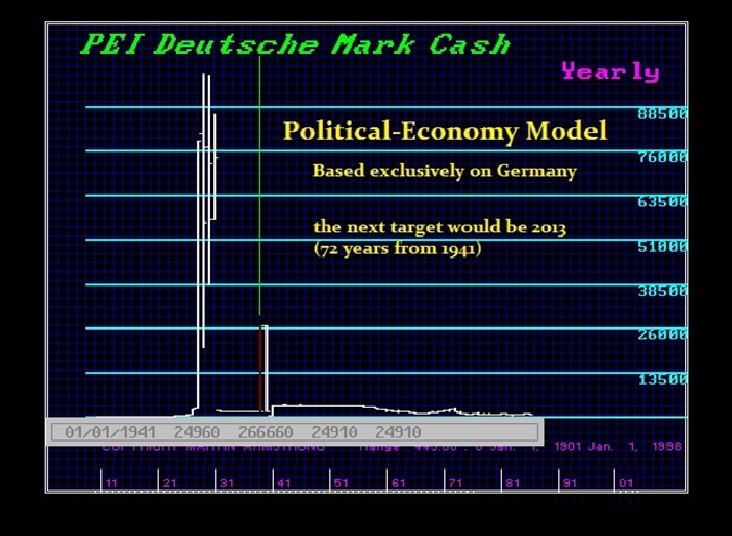 The German Hyperinflation was by no means CAUSED by printing money. That was the symptom which resulted. It was caused by a Revolutionary Government disavowing all government debt of the previous government which wiped out banks and much of the “rich” The new currency which replaced the hyperinflation issues restoring order was still paper but it was backed by REAL ESTATE. This was a classic PUBLIC v PRIVATE shift. We are in a debt crisis and civil unrest will rise increasing the risk of separatist movements and debt defaults by countries. As this cycle materializes, we get the classic shift from PUBLIC to PRIVATE assets. During the German Hyperinflation, ALL tangible assets rise from real estate, stocks, to gold. It is not EXCLUSIVELY gold. The propaganda these people have filled the heads of the media and ruined so many novice investors is truly criminal. They have distorted events to suit their exclusive purpose to promote gold sales and some argue for money must be tangible and want to embrace a gold standard as if this has EVER worked even one time confusing people using gold coins with a fiat-type declaration that gold is worth $100,000 and ounce. Just pure insanity and so far off the mark it is beyond description. They should be handing out flowers in airports while chanting. We face a very serious situation and to survive this, we must consult history, not propaganda. This is the PUBLIC to PRIVATE shift which historically takes place with the collapse in ALL governments. The question that surfaces: where does cash flee to? Government debt? This is the problem with models or personal opinion that lack the historical perspective and constantly see the same result time and time again. Markets are far more complicated than just that. This will take a computer to track all economies and trends moving simultaneously. The markets will give us the timing. They always choreographs the coming move if you pay attention. 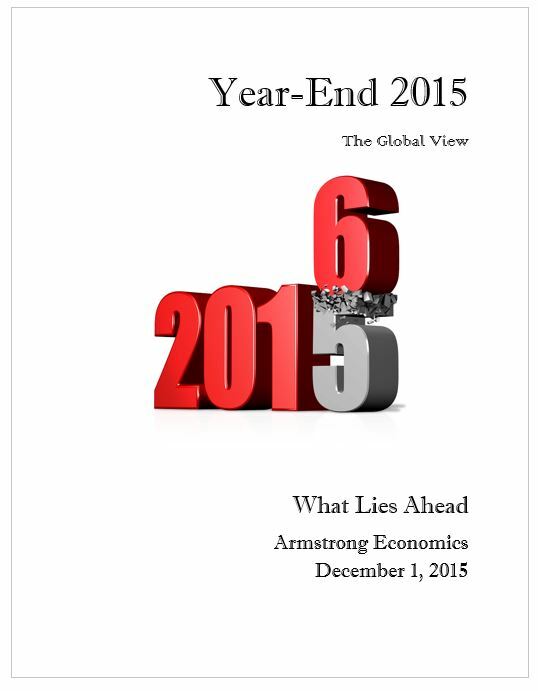 This is even what the Global Market Watch says on the yearly level PAY ATTENTION. 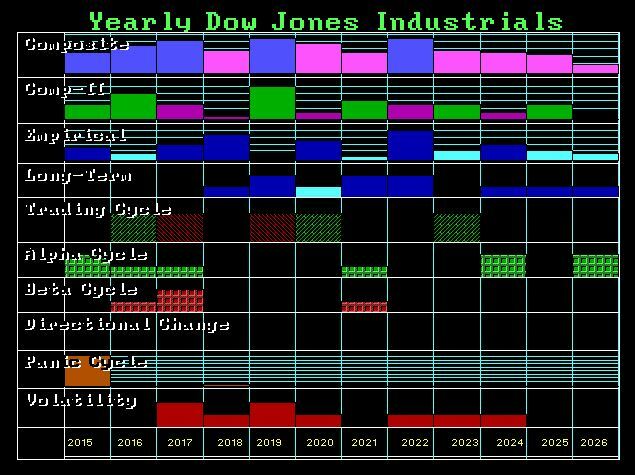 Either we get the sling-shot move, fake everyone out to the downside as rates are forced higher at first, and then as they see the world coming to an end, the flight to private assets unfolds between 2017-2020 when the War Cycle also turns up rather aggressively. We have 2017 as a Watershed Year for this will be perhaps more like 1933 when FDR, Hitler, and Mao all came to power. We have the US elections in 2016 with the president taking power in 2017, we have many of the leader in Europe finally up for election such as Hollande in France and Merkel, then we have G20 shutting down the entire global economy requiring full cross-border reporting of all money flow for taxes. Several countries will have moved to electronic money by then as well. So we can see that instead of a high, 2017 could be a low and this whole mess is extended for that becomes the starting point rather than the end.